February 26, 2019 February 26, 2019 Pilar B.
Montessori is not a curriculum – not a series of boxes to check off. It’s a guide for understanding how humans grow. It’s a way of supporting how humans learn. It’s a means for finding joy and purpose in life. Montessori is not dogma – not a script to follow blindly. It’s a conversation about priorities. It’s a toolbox for navigating parenthood with grace. It’s a dance with the imperfect realities of life. Montessori is not just for the wealthy – not a ticket to career success. It’s for the homeschooling family. It’s for the public school family. It’s for the refugee, the migrant, the orphan, the elderly. Montessori is a way of seeing and being. It’s a new understanding of the adult’s role and a window into the child’s soul. It’s a path that leads to trust; a path that leads to peace; a path that leads to life. February 16, 2019 February 16, 2019 Pilar B. Few clean-ups seem as overwhelming as that of the Montessori fractions. The halves through sevenths are easy enough for most children, but the 27 hard-to-distinguish red wedges that make up the eighths, ninths, and tenths can leave even Elementary children feeling stuck and discouraged. I’ve inherited Montessori fractions in several of my classrooms, and I’ve often found that a well-meaning predecessor had written the corresponding value on the underside of each fraction piece. At first glance, this might seem helpful. It sure makes cleaning up those pesky fractions a lot quicker! So, why did Dr. Montessori design the fraction pieces without labels? Did she harbor some evil desire to torment children and their over-worked adult guides? Or did she observe that leaving the fractions unlabeled led to the development of problem-solving skills through creative use of the child’s knowledge? Is writing the values on the underside of the fraction pieces really necessary? Or, by doing so, are we preventing the child from developing essential skills? If we don’t want to be a hindrance to their development, but we need them to eventually clean up, what can we do to guide a child who’s feeling discouraged by this overwhelming task? If the child is younger and doesn’t know this information, simply guide him in a sensorial exploration. Invite the child to bring out the fourths inset, ask him to remove one fourth, and show how the space within the inset serves as an objective control of error. When fractions other than two eighths are placed within the space vacated by the fourth, you will see a gap. Only two eighths will fit perfectly within the space of the missing fourth. The monumental clean-up now becomes a fun puzzle that satisfies the child’s love of precision and bolsters his self-confidence. You can back away, returning only if he needs guidance to find the relationship between fifths and tenths, or thirds and ninths (children familiar with equivalences will likely make the connections on their own). Take a moment to observe the child’s concentration, enjoy his smile of accomplishment, and know that you helped him move one step closer towards reaching his full potential as a creative problem-solver. February 9, 2019 February 9, 2019 Pilar B.
Zachary, age 7, asked me how Valentine’s Day started. I told him we could research that at the library, but later that night I got curious and went online. I found conflicting information, so I decided to put together a Cosmic Education story to tell him the tale of the origins of Valentine’s day. I shared it with him and it inspired us to make care packages for the people experiencing homelessness in our area. I hope it can inspire acts of kindness, or at least get some conversations started, among the children in your life. Note: I don’t follow any religion, and I’ve tried to make the story as secular as possible so it can be used widely. I use the lower-case “g” in all instances of the word “god”, but if that bothers you, feel free to copy/paste and edit at will. This story is meant to be told orally, as are all Cosmic Education stories, so you can adapt it to fit your audience and/or beliefs. Have you ever wondered where people got the idea to celebrate Valentine’s day? Historians don’t have much information to go on, so I’m going to tell you one of their theories. For this story, we’re going to go back in time, almost 2,000 years ago, to a country in Europe called Italy. Italy was the home of the Ancient Romans. The Roman Empire was very powerful, with a large army and a series of emperors that controlled land from Northern Africa to Western Asia and a large part of Europe. The Ancient Romans believed in many gods. You’ve probably heard of Saturn, Jupiter and Neptune… Before they were the names of planets, they were just three of the hundreds of gods the Romans worshipped! Keeping the gods happy was of utmost importance to the Ancient Romans, and the Emperor would throw in jail anyone who didn’t believe in these gods or who refused to make sacrifices to them. One of the groups of people at risk of being jailed were the Christians. This small group believed in only one god – a god very different from the Roman gods – and felt their mission in life was to help people who were poor, sick or hurt. After receiving help from the Christians, these people would often convert – they’d stop believing in the Roman gods and start worshipping the Christian god. As you can imagine, this made the Roman Emperor very, very angry! Valentinus died in jail on February 14th, which was around the time of the Ancient Roman feast of Lupercalia. This rowdy party celebrated love, and when the Christians became more powerful than the Romans, they replaced this raucous festival with a day to remember the work of St. Valentinus. And thus, Valentine’s day was born! You can research how the holiday evolved to include chocolates and love poems; it’s quite an interesting story that will take you to Medieval England. I look forward to hearing what you discover. But for now, when we celebrate Valentine’s day, let’s take a moment to think about how we – like Valentinus – can make the world a better place by helping those who are poor, sick or hurt. Because that’s the true spirit of Valentine’s day! March 24, 2016 March 25, 2016 Pilar B.
I challenge you to think of one activity that exposes your child to math, language and science, while helping her develop concentration, motor skills, and delayed gratification. It’s not found in workbooks, and you probably won’t see it taking place regularly in most schools (unless they’re Montessori schools). If you want to know what it is, click here! March 22, 2016 March 25, 2016 Pilar B.
I recently posted a picture of 9-month-old Nadia’s shelves on my Facebook page, and several people wrote to me asking for links to her toys and materials. I hope this helps you when you set up your baby’s shelves! Takane ball: I made the ball for Zachary when he was a baby, and both kids have gotten a lot of enjoyment out of it. I used this tutorial from Beautiful Sun Montessori, but there are many other tutorials out there if you search for “takane ball instructions”. I have very basic sewing skills, so if you have a sewing machine (and time), you can make one, too! Wooden grasping toys: Ours were gifts from my lovely A-to-I trained friends, and Nadia has loved them since she was a tiny baby (I rotate them in and out). You can find them on Etsy. Wooden car: We have a set of wooden cars made by the German toy company Grimm. They are sturdy and lots of fun for toddlers to crash! For Nadia I rotate one at a time, but when Zachary was a toddler he enjoyed racing them with mommy and daddy. You can find them here. Basket o’ rattles: These are different noise makers we’ve picked up along the way… A maraca from Mexico, a wicker rattle with pieces of tin inside, a doll with a rattle inside, and a couple of Hape rattles, including this funny one (link). Object permanence box: She LOVED this from the moment I took it out of the box. The quality is remarkably good for the price, and we just switched out the plastic ball it came with for a sturdier wooden ball because it has a more pleasing sound when it hits the bottom of the box. Here’s the link. Peg and two rings: The peg comes from this Melissa & Doug toy (link) that we got as a gift, which she’s still too young to use, and the rings are napkin rings from the local thrift store. I have different kinds of rings (metal, wood, ceramic) that I switch out for variety. Geometric shape puzzle: The shapes are part of a Melissa & Doug three-puzzle set that includes six animals and three shapes. I think the set I have is discontinued but this is a great alternative (link). Wooden nesting/stacking bowls: They’re also from the Grimm compa ny, and they are one of her favorite toys. We had a three-year old friend come over to play, and she had a great time stacking them, so it’s a toy with plenty of growth potential! The wood is beautiful and very high quality. You can find them here (link). Geometric solids: These belong to the Hape Shape Sorter (link). She’s not old enough to understand sorting yet, but she likes how the shapes rattle (they have little balls inside). Once she’s old enough to sort, she’ll already be familiar with the shapes! World globe: I really like this one from Reprologe (link) because it has the tilting and swiveling base that allows you to see the South Pole without having to flip the base over. It has raised topography and up-to-date political geography. The reviews are mixed on Amazon because sometimes the meridians don’t line up, but ours is defect-free and it’s been a HUGE hit with Zachary. Sandpaper letters: These lower-case cursive letters (link) are a great investment, since the children use them from the time they’re learning sounds (around 2.5/3 years of age) until they’re perfecting their handwriting (lower elementary). Basket of objects: These are miniature objects I’ve collected though the years, including animals, furniture and cooking utensils. These are also a great investment, since you use them for language development when they’re toddlers, then Sound Games at 2.5 years of age, and then as inspiration for writing words with the Moveable Alphabet. 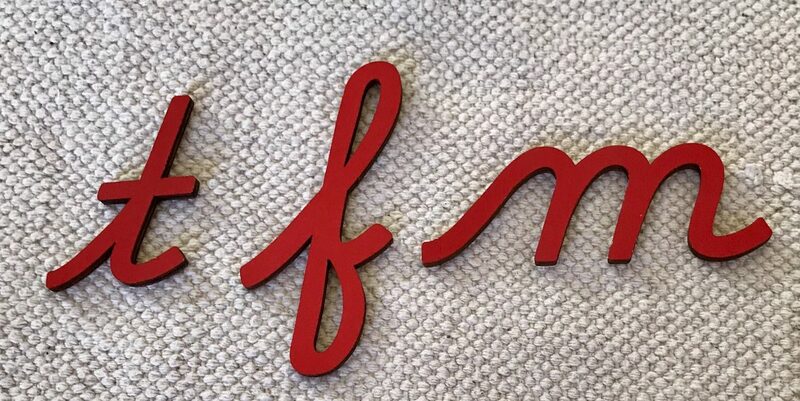 Moveable Alphabet: I am in love with this medium cursive alphabet (link)! The letters are made out of wood, they are sturdy and attractive, and they have a nicer weight than the more expensive plastic ones from Nienhuis that most AMI classrooms have. Plus, each compartment has its corresponding letter printed on it, for easy clean-up (another thing that more expensive plastic model don’t have). For a homeschooling family, I think this is the ideal Moveable Alphabet. Feel free to drop me a note if you have any questions about any of these materials, including how I present them to the children! Disclaimer: Some of these links are affiliate links, and The Full Montessori will get a few pennies from your purchase through Amazon. Thank you for your support!